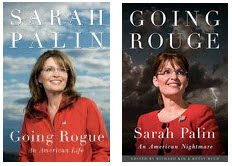 From today's Publisher's Lunch: "OR Books is issuing GOING ROUGE: Sarah Palin, An American Nightmare on November 17, the same day when HarperCollins publishes GOING ROGUE: An American Life by Sarah Palin." Why it's legal: "Titles of books cannot be protected as trademarks (a clear rule); trademark protection does not accrue until the mark is used (no sales yet); both books would be "in use" on the first day (Palin cannot claim first use); "Trade dress" does not exist unless the graphics are inherently distinctive (doubtful) or well recognized (too soon); and the "Nightmare" title may even be a valid parody (a good defense). Each of these theories has a countervailing argument, but on each, the legal arguments might be a nightmare for Palin." So mean, but so good. rock ON. That's hilarious. Yay for the subversive use of copyright law!